One of the most robust scientific findings is the direct connection between global warming and more extreme deluges. Scientists have observed a sharp jump in monster one- and two-day rainstorms in this country. Warmer air can contain more water vapor than cooler air. Global analyses show that the amount of water vapor in the atmosphere has in fact increased due to human-caused warming…. This extra moisture is available to storm systems, resulting in heavier rainfalls. Climate change also alters characteristics of the atmosphere that affect weather patterns and storms. That final point from our leading scientists is very important. The worst deluges have jumped not merely because warmer air holds more moisture that in turn gets sucked into major storm systems. Increasingly, scientists have explained that climate change is altering the jet stream and weather patterns in ways that can cause storm systems to slow down or get stuck, thereby giving them more time to dump heavy precipitation. What does this all mean for the answer to these questions? “Did global warming cause Phoenix to have its wettest day ever recorded? Did global warming cause the Midwest to receive two months of rainfall in one week (in August)? The air is on average warmer and moister than it was prior to about 1970 and in turn has likely led to a 5–10% effect on precipitation and storms that is greatly amplified in extremes. The warm moist air is readily adverted onto land and caught up in weather systems as part of the hydrological cycle, where it contributes to more intense precipitation events that are widely observed to be occurring. Those of you in the Northeast who thought you’d noticed deluges becoming more intense were right. Thanks to climate change, when it rains, it pours, literally. 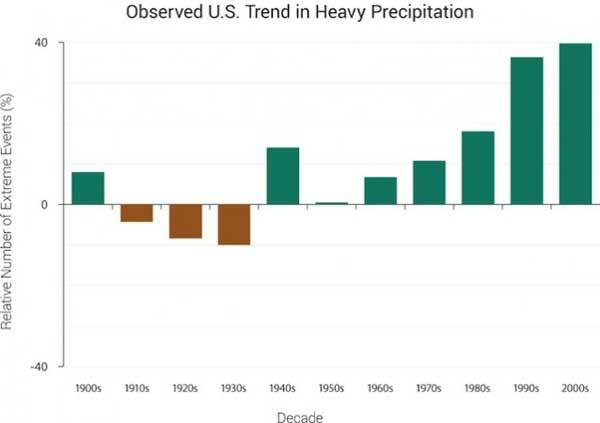 As the NCA explained, “The heaviest rainfall events have become heavier and more frequent, and the amount of rain falling on the heaviest rain days has also increased.” Some 70 percent more precipitation falls in the heaviest rain events now than it did in 1958. 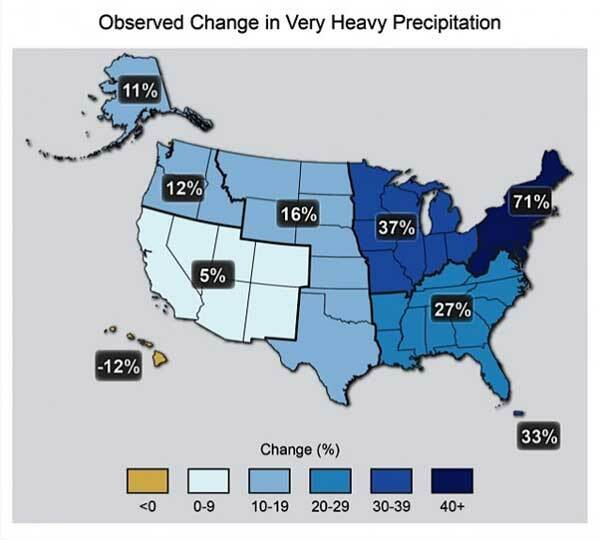 Ironically, what this means is that even for the regions that are expected to see a drop in total annual precipitation — such as the Southwest — more of the precipitation they do get will be in the form of deluges so intense they can create terrible flash floods. Sound familiar?